These playfully coloured gladioli are frilly and fun. Each bright yellow blossom has a dash of red on its lower petals. Seriously fun! Looking for something just a tad unusual? 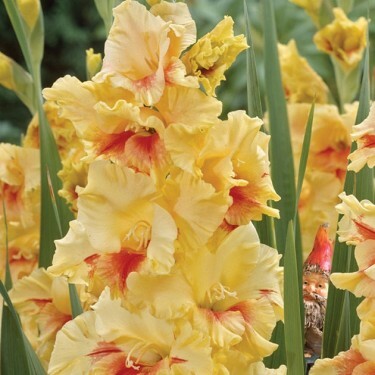 You’re sure to turn a few heads with this Dutch Gladiolus. These blooms will add a softness of hues to any cutting garden and a wonderful addition to any fresh cut bouquet! We suggest planting your Glads at intervals of 2 weeks, which will allow you to enjoy them in your arrangements throughout the season. For longer lasting arrangements make sure to cut the spike when only one to three florets are open. Plant your Gladiolus in full sun away from strong winds. Staking is usually necessary - after the buds have formed place stakes at about 2 in - 5 cm from the base of the stems so as not to damage the corms. In Zones 3-6 corms should be dug up in the fall and stored in a frost free place until the following spring when they can be replanted.